Before Bo got sick, he was a wild, crazy, silly boy. I want to start writing about some of the fun, happy memories we’ve had with Bo. Bo and I had just moved into our townhouse and we wanted to clear out the small backyard, so we could do more outdoor living. It was full of weeds, vines, brush, and trash. It was awful. We concluded that our townhouse must have been built on a landfill, at least that’s how it felt. It took us a few days, but we cleared out the yard. 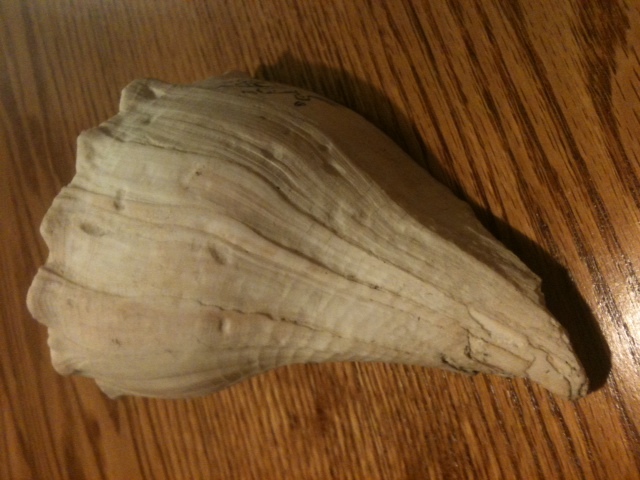 We found some very interesting items during our cleaning, one of which was a conch shell that Bo found. He started tossing it around and playing with it immediately. He would run around with it in his mouth, bark at it, dig around it, he was enthralled with this thing! We kept the conch shell because it was so entertaining to watch Bo play with it. 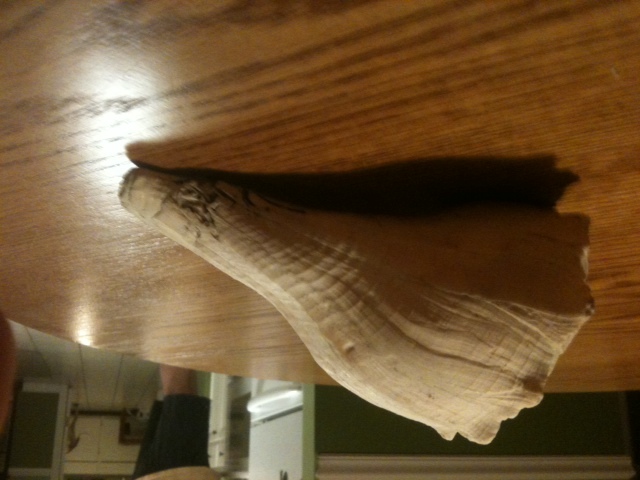 This conch shell stayed around and we never really thought much of it. It was Bo’s favorite “toy”. He would always try to sneak the dirty thing in the house, but it was definitely an outside toy. Bo chewed on the shell, played with it, and carried it around for years. It never chipped and amazingly never got lost. It would go missing for a while, but would always turn up again in the yard somewhere. 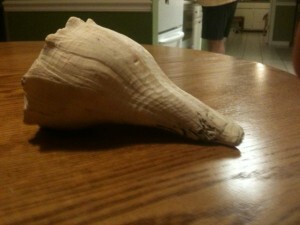 When we moved the conch shell came with us. It continued to be Bo’s favorite play toy. 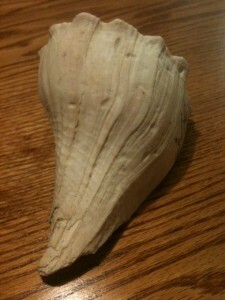 When Bo got sick, the outdoor, never allowed inside the house, conch shell magically found it’s way into the house. It became a sort of talisman for Bo’s health. We’d lay it next to him when he was sleeping. When he was recovering from surgery and staying in the guest bathroom most of the time to recover, the shell was there. Even when food was of much interest, Bo would still perk up when he saw or heard (it has a very distinct sound when it hits the floor) the shell. We brought the shell out on the porch with Bo the day we set him free. Now, the shell has a spot on our mantle and I think about Bo every time I see it. What was discarded trash in the backyard became a priceless keepsake to us. I miss Bo every day and I hope that he’s found some new treasures at the Bridge. Awww. What a sweet story!!! Wow, that IS a great story. It could be a tear jerker if you let it. But I’m choosing to smile. What a great way to remember Bo! That shell is a treasure for sure. how special is that!!! thanks for sharing bo’s story, it’s so sweet. you guys definitely have a forever keepsake on your mantle. Meghan, thanks so much for sharing that part of Bo with us. He was very special, and we all know it, but little things like this paint a fuller picture of him. I want to know more! It is amazing how a bit of “trash” can become such a treasure. What a beautiful remembrance of Bo. That is a great story. I know you will treasure that conch shell forever! You did a beautiful job sharing this story! Love it. I love the way the shell symbolizes your journey from the earliest days of when you moved into the landfill, to making a beautiful home together. Maybe there was something in the shell that Bo heard, some kind of magical juju that made him hoppy just by batting it around? Whatever it was, that shell is priceless now. What a treasure. Where we are… Has it really been a YEAR? Bo's Story is brought to you by Tripawds.